Matcha is a finely ground powder made from the highest quality green tea, and is often used in Chinese and Japanese tea ceremonies. It has more antioxidants than spinach, broccoli, wheatgrass and blueberries, and helps protect your liver against damage so it can properly remove toxins from your blood. Matcha green tea can also promote smooth, glowing skin, improve digestive issues such as constipation or bloating, and delivers amino acids which help improve memory and concentration. Oats are a gluten-free whole grain and among the healthiest food you can eat. They are a rich source of protein, fiber and carbohydrates, and packed with a variety of B Vitamins, folate, minerals, antioxidants and Beta-glucan. Oats have many unique components which can aid weight loss, reduce blood sugar levels and the risk of heart disease, encourage good bacteria in your gut, reduce cholesterol, and can keep you feeling fuller for longer. Rice milk is a plant-based product suitable for people who are lactose intolerant, allergic to nuts or soy, or simply looking for an alternative to other milk. It is often fortified with calcium, vitamins and iron, and some brands are sweetened with sugar or vanilla. It is made with boiled rice, brown rice syrup and brown rice starch, and whilst it’s higher in carbohydrates, it has a much lower fat content than regular cow’s milk, and fewer calories per cup. Other popular alternatives to rice milk include almond milk, soy milk and oat milk. Why use pink Himalayan salt over regular table salt? Well, at over 99% pure, it’s one of the healthiest, cleanest salts you can find. It comes from salt mines 5.000 feet below the Himalayas, and contains over 84 minerals including calcium, potassium, magnesium, copper and iron. Most table salt suffers a loss of minerals due to it being heavily processed. In fact, most only contain one mineral (sodium), and include other agents which are added to avoid clumping and maintain a bright white color. This recipe serves four people, and only takes a few minutes to make. Place a saucepan over a low heat and pour in the milk. Then add all the other ingredients, and bring the porridge to a simmer. Keep stirring so it doesn’t catch on the bottom. After a few minutes you’ll notice the mixture starts to thicken, which means it’s ready and time to take off the heat (cooking tip: whole oats take longer to cook than if they’re rolled, crushed or steel cut). This is a great meal to share with family and friends. 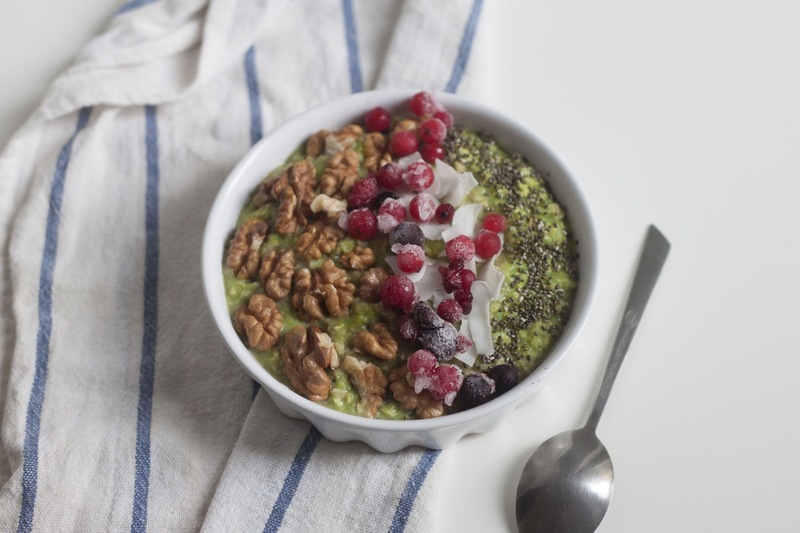 You can serve the Matcha porridge plain, and let everyone choose their toppings and have fun with their own flavors. Kids (and adults) love it!